The Amazon Basics alkaline batteries are regular alkaline batteries made for Amazon and sold online through the retailer’s websites. They should normally come pretty fresh as the volumes are high with a big online retailer and no time for batteries to expire, so it is a good idea to go for these as fresher alkaline batteries do manage to perform better. 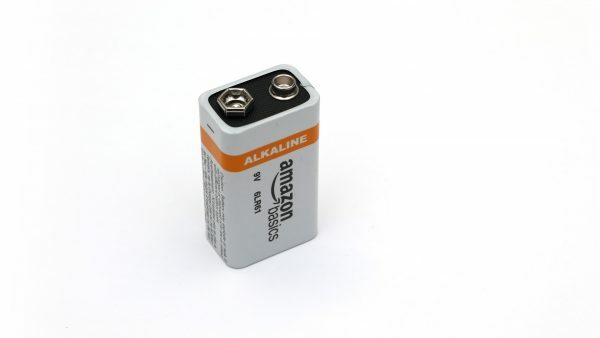 According to the Amazon website the 9V Amazon Basics alkaline batteries are with 3 years shelf life, but looking at the expiration date on the battery we have tested (01-2024) it seems that they are actually 5 and not 3 years. Amazon sells these at 4-pack and 8-pack only, so you cannot purchase just a single battery should you need only one and that can be a bit of a drawback as the rest of the batteries will be sitting in a shelf until you need them. Our test of the 9V Duracell Industrial Alkaline battery at the standard constant current discharge rate of 0.05A has shown a usable capacity of 481 mAh and that is really good result – one of the top ones so far in our tests. The 1st place however is still taken by IKEA with their 9V Alkalisk alkaline battery that manages to perform slightly better compared to the Amazon Basics battery, but the Amazon one still did really well and it if comes cheaper to your door than the IKEA one it is still a great choice (or the IKEA one is not available).